Are you a mama with little ones who are completely oblivious to where fruits and vegetables really come from? Do they think the stores just magically put them all on their shelves? Or just not care enough to even wonder about it? Do they freak out if they find a speck of dirt on their carrot? But with all the information out there warning us to pay more attention to what we’re putting into our bodies – about GMOs, the danger of pesticides, and the growing demand of organic foods – it raises concerns about where our food really comes from. The farther we get from the source, the more concerning it becomes. Do you really know where that tomato comes from? Do you know if the chemicals on it cause tumors, cancer, or obesity? Rather than sitting there wondering about the food at the grocery store, I decided I wanted to grow some of my own! No pesticides or chemical sprays, just good ol’ fashion greens. Now don’t get me wrong – I didn’t know anything about gardening before getting started, and I certainly wouldn’t call myself an “expert”. But I’ve learned a lot through trial and error, and with a lot of help from my future mother in law! (She’s a master naturalist.) So, I started growing fruits and veggies in a small container garden at our last apartment. More recently, we’ve graduated from taking care of that small container garden to caring for my Mother-In-Law’s 5 raised bed garden plots, full of a delicious variety of green veggies! Asparagus, lettuce, spinach, cucumbers, zucchini squash, peas, broccoli, cabbage, carrots, onions… I’m so spoiled now! 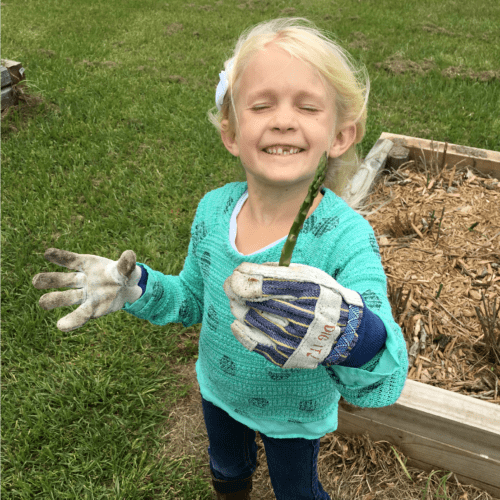 They love helping us garden (even my youngest gets out there to pull “weeds” lol). 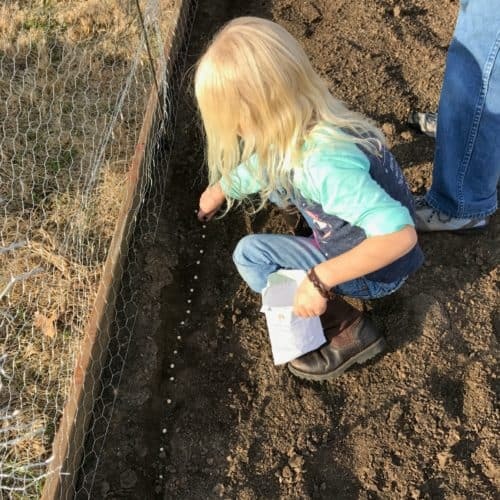 My oldest has helped us plant, weed, water, and harvest. 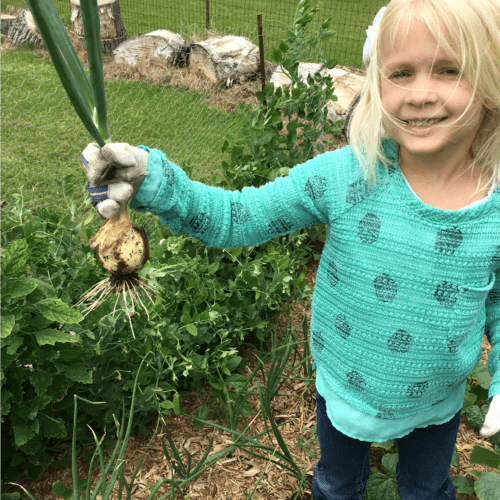 Not only is she learning the responsibility of caring for plants, but also what it means to grow your own food. How dependent plants are on the weather, how to determine when certain vegetables are ripe and ready to pick, and how different plants grow in different ways. Growing your own food doesn’t have to be limited to those with land or big backyards. Like I said, we started out with a small container garden we cared for on our apartment’s back patio. Using old trashcans and plastic planters, we grew herbs like basil, strawberries, potatoes, and onions (basil did the best!). 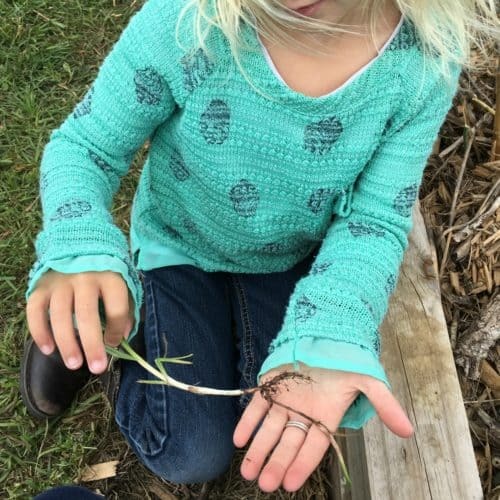 If you’re looking to teach your little ones the truth about where food comes from (yes, it comes out of the ground, and yes there’s usually dirt on it!) then here’s what you need to know. Some of the foods currently growing in our raised beds are ones we started from seeds (like the peas) and others from bulbs (onions) or small plants (cucumbers). 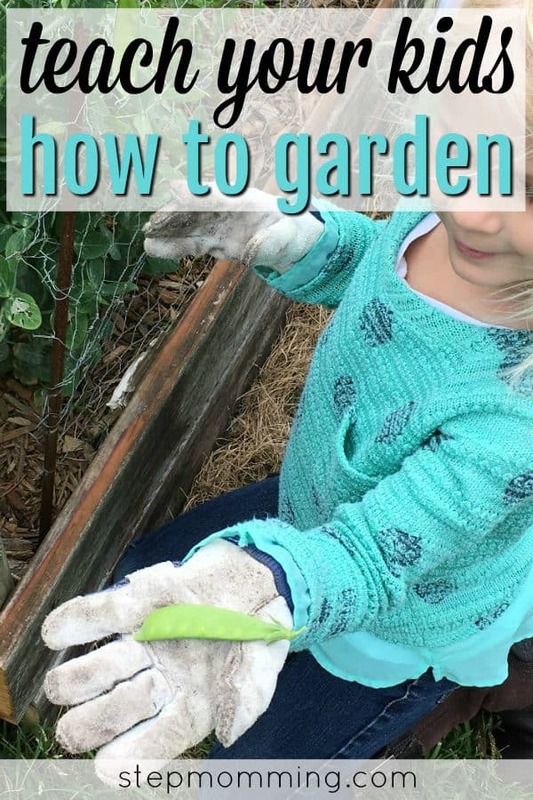 It’s good to try different ways of starting off the process so that your child can see for themselves that there’s more than one way to plant a garden. As far as where to plant them goes, there are several options. You can plant directly in the ground or in raised beds, start seeds in a smaller container inside and transplant them later, or plant in the planter you plan to keep them in. 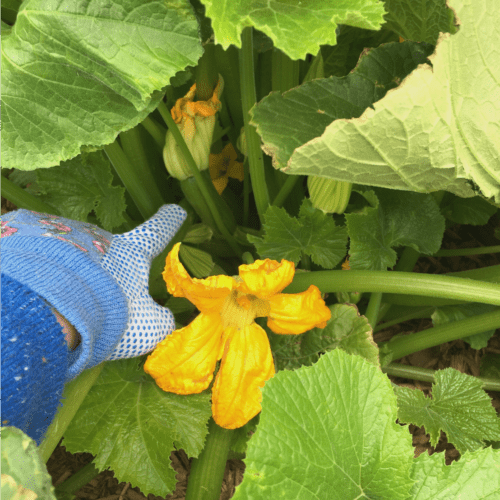 I say whatever is less complicated – do that – just keep in mind that wherever or whatever you plant in will directly affect the growth of your greens. 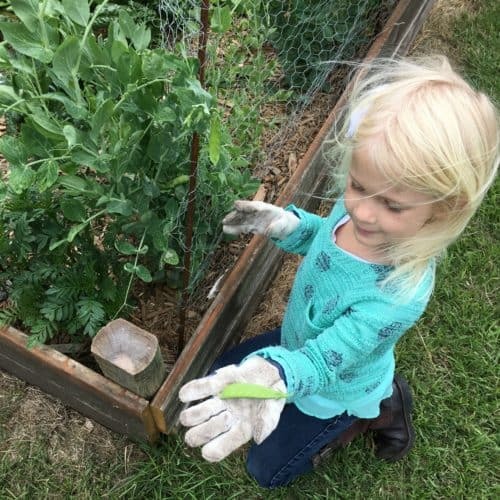 The peas are producing the best for us right now, and K planted those directly in the ground. You’ll also want to make sure you have some good soil to plant with. After my MIL turned us onto “dyno soil” (a mixture of compost, dirt, manure, and sandy soil) I’ll never go back! Packed full of nutrients, that stuff works better than any other soil I’ve ever planted with! The watering situation is going to depend on what plants you’re growing. Some thrive in moist climates, others in dry ones. Read up on your plants before you dive in so that you know how to teach your little ones to care for them. We water our garden plots once a week, unless it rains. The dyno soil we used is really good about staying moist (our natural soil alone gets super dry). Plus, my MIL put mulch around her garden plots to help keep the moisture in the ground instead of evaporating in the hot Texas sun. 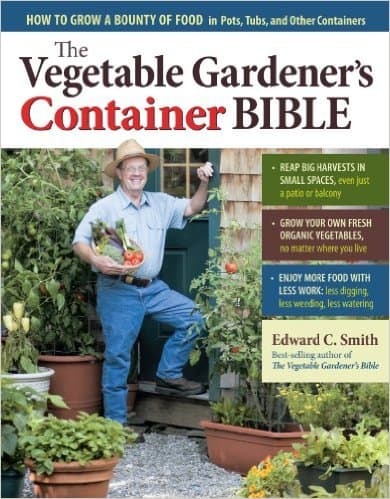 If you’re looking for some literature on the specific care for certain plants, I enjoyed the Vegetable Gardener’s Container Bible when I first started out in containers. 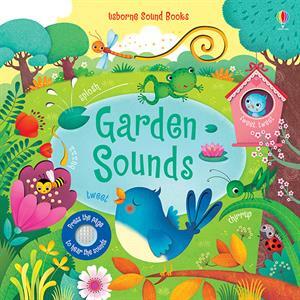 Of course, Amazon.com has lots of other books on the subject of gardening you can check out, no matter what you’re growing or where. Patience, patience, patience! Waiting for plants to grow is one of the best ways to teach little ones that patience is a virtue. Plants don’t always spring up overnight and food takes time to grow. 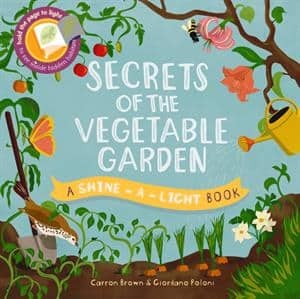 While you wait for the plants to sprout, you can also start teaching kids about weeding the garden. Remember the mulch we have that helps keep moisture in the ground? It also helps keep weeds at bay, but nothing is fool-proof. 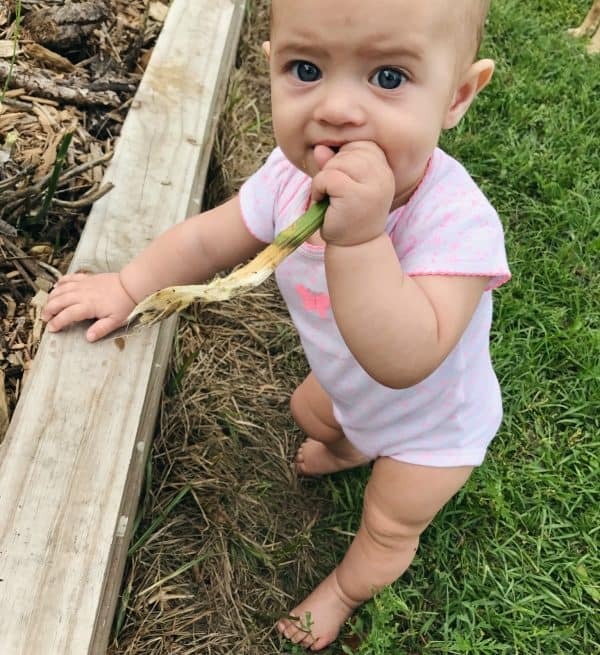 Once your plants grow and start producing food to eat, you’ll need to teach your little one how to determine what’s ready to harvest. Each vegetable plant is going to be different as far as time frame to pick and how often you can harvest goes. Make sure you read up on your particular plants and show your child pictures of what to expect. Asparagus plants don’t produce the first year they’re planted, but this year we’re finally getting some asparagus to eat! It has to be picked every day, so we make sure to go out every morning with a pair of scissors to cut the stalks. The peas have been sprouting for the past month and continue to produce daily, but we usually wait to pick until the pods are nice and fat, which works out to about 2-3 days a week. The lettuce, kale, cabbage, and spinach have all produced really nice big leaves to eat. We harvest these whenever we plan on using them for dinner, with plenty to share with friends and family. Our onion plants have started getting nice and plump, too. We pull them whenever we need an onion for our next meal. Having our own little vegetable garden producing our favorite greens within arm’s reach is such a blessing! We don’t have to worry so much about produce going bad if we don’t use it in time. It stays on the plant, or goes in the pot. 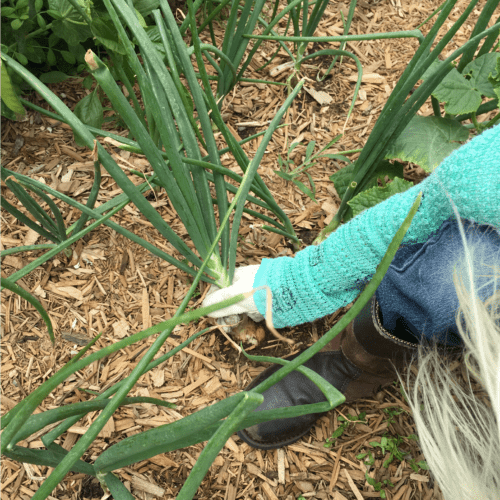 I think when you lend a hand in growing it, the food seems much more valuable in your own eyes, so much so that you’d hate to ever have to throw it away. 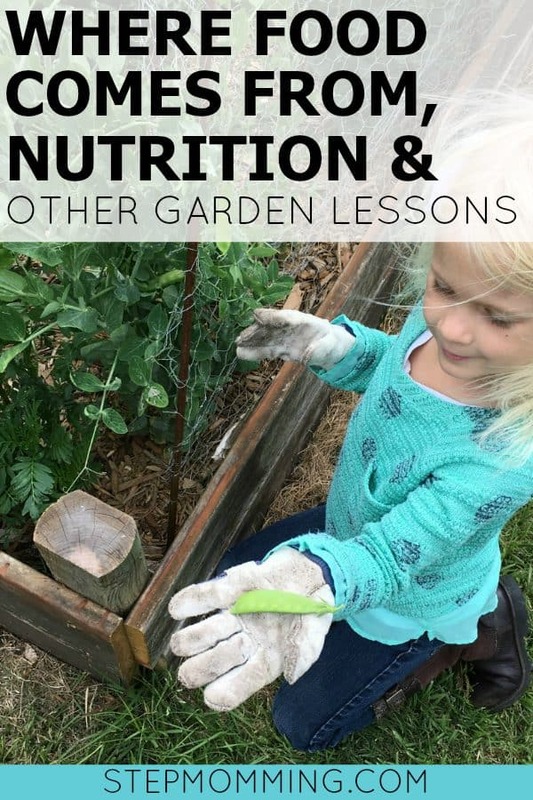 Plus, our daughters are learning so much from gardening! And throwing in a couple extra greens into each meal is so beneficial for their growth and nutrition. 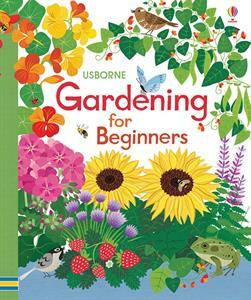 Want to combine Gardening and Reading for an extra learning session? Check out these suggestions!